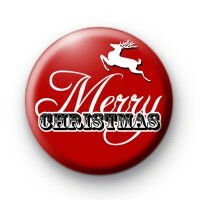 Merry Christmas Reindeer Badge in a lovely deep red colour with Merry Christmas written in a festive black and white font & a prancing christmas reindeer in the top corner. These merry Christmas badges are perfect to hand out to your friends & family at christmas and are always popular with teachers. We have a good selection of reindeer badges and merry christmas badges in our xmas badge category. Our reindeer badges are so festive & are all hand made in our family workshop. Standard 25mm button badge.